Norrporten Arena or as it was previously known as Idrottsparken, is a multi-purpose sports stadium located within Sundsvall in Sweden. Capable of seating 8,500 supporters it is currently home to GIF Sundsvall who were promoted to Allsvenskan in 2014. Norrporten Arena first opened in 1903 as a multi-purpose sports stadium for the city of Sundsvall. Municipally owned, the stadium was originally known as Idrottsparken which basically translates into English as “Sports Park” however since 2006 it has become known as Norrporten Arena when the property company purchased the stadium from the local council. Originally featuring an athletics track around the perimeter of the pitch, and consisting of very basic facilities, Norrporten Arena’s capacity peaked in the 1960s with a capacity just under 17,000. The record attendance of 16,507 was set on 15th October 1961 during a football match between GIF Sundsvall and Högadals IS for qualification to the Allsvenskan. The stadium was entirely rebuilt over the course of two years between 2001 and 2002 resulting in its current capacity of 8,500 which includes 500 terrace places. With four asymmetrical stands arranged to fully enclose the pitch, Norrporten Arena is arguably one of the most unique football grounds in Sweden. Costing a total of 150 million SEK for the renovation work, one of the largest talking points was the fact that the natural playing surface was replaced with artificial turf. Now fairly common in the Allsvenskan and across Scandinavia, Norrportern Arena was actually the first elite stadium to make the switch in Sweden having done so at the start of the 2002 season. Home to GIF Sundsvall and >Sundsvalls DFF, Idrottsparken is occasionally used to host large outdoor concerts. Famous acts which have appeared over the years include Bryan Adams, Rod Stewart, The Eagles and Elton John. Individual images of each stand coming soon. 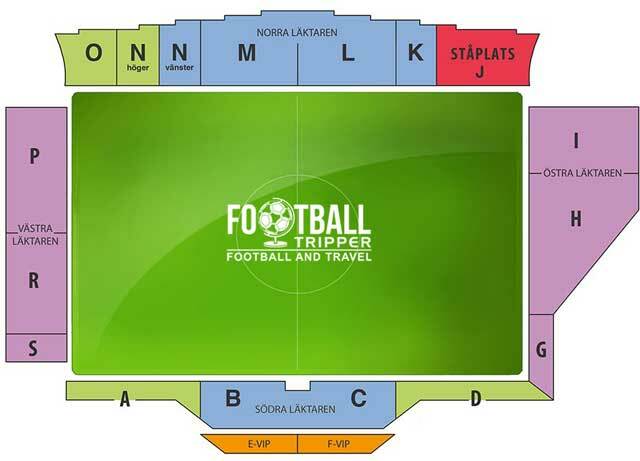 Away fans (Bortasupportrar) are housed within the red “Staplats” section J of the northern stand as per the above seating plan. No information online regarding the club shop however you should be able to pick up souvenirs on matchdays if every other stadium in the world is anything to go by. We haven’t exactly checked but we really doubt guided tours of Norrporten Arena exist. Tickets to see GIF Sundsvall can be purchased online (print at home or send to smart phone), from the club’s office during the working week (12.00 – 3.00 pm) and at the stadium 2 hours before kick-off from the ticket booths behind the east stand. Please note that the above prices are inclusive of service charges unlike some clubs who add it on at the end! Norrporten Arena is located centrally within Sundsvall 1.3 km from the central railway station just across the bridge. It can easily be walked to by most Football Trippers in well under 15 minutes, probably more like 10. There is a large car park located west of the stadium which seems perfect for matchday usage. Sundsvall Centralstation is served by numerous services around Sweden including to the likes of Stockholm and Gothenburg. The back of the main stand in all of its glory. The stadium has a bus stop located along Universitetsallen known as “Sundsvall Idrottsparken” and served bus number 3. Sundsvall-Härnösand Airport is located 25 km north of the city centre along the E4 motorway, and has a number of daily flights to Stockholm, Bromma and Arlanda courtesy of Scandinavian Airlines. Within the city centre there is the likes of a Best Western, Hotel Continental and the quality Hotel Sundsvall. Two more affordable places worth checking out are STF Sundsvall City Hotel & Hostel, and Södra Bergets Hostel Sundsvall.